Today, Sunday February 2nd is Groundhog's Day, here's your official Twin Cities Groundhog Report. It was a beautiful day with clear skies. We'we had an incredible winter so far with several visits from the dreaded Polar Vortex. As all the real groundhogs are still hibernating in Minnesota, we cog course need a stand-in groundhog. Alas, as I now work at a different nature center, Stuffed Stanley is no longer available. Just like last year, shadows were plentiful. 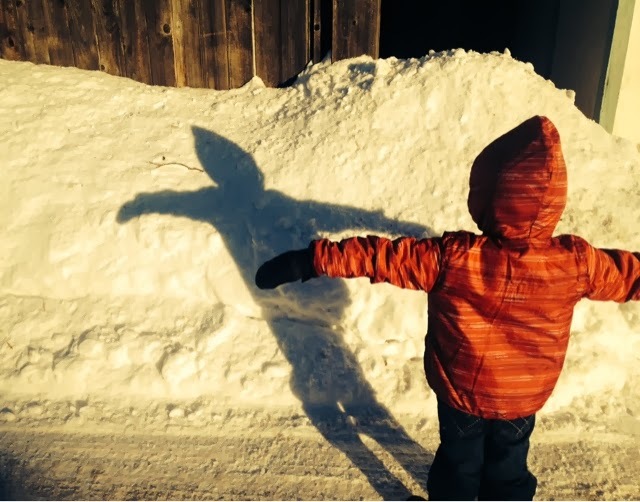 According to legend, the sudden appearance of the shadow scares the groundhog back into hiding and we will have six more weeks of winter. If he does not see his shadow then spring will soon be here. The groundhog DID see his shadow in the Twin Cities so we have six more weeks of winter to look forward to. Here's the catch though, I've been watching something interesting develop on the very long one-month extended forecasts. For several weeks now there have been predictions of a warm up starting on February 10th. I figured it was just some wacky long range anomaly but as we get closer it seems to be holding. The current predictions are that we will have a major warm up starting on the 10th and lasting about 5 days. There will be almost a full week of above freezing tenperatures and we could see 40 degrees! Rest assured winter lovers, it will get cold again for the last two weeks of the month before March brings perfect maple syrup harvest weather of above freezing during the day and below freezing at night. What's the connection between Groundhogs, shadows and the seasons? The connection is tenuous at best. Further south than Minnesota, male groundhogs do come out of hibernation early to scope out and check on their breeding territory. In Minnesota, February 2nd is usually too early for this to happen. Seeing the first groundhogs checking out their territory is surely a sign of spring though. Okay, but what does seeing a shadow have to do with it? The connection to shadows has to do with prevailing weather patterns. We often associate sunny days with warmth and the coming spring but sunny days in the winter aren't always warm. Clear winter days are often the result of cold Canadian air that has settled over the state. A shadow in the winter often means we're in a pattern of cold air flowing south. It can take many weeks to break that pattern and warm the area. All of the snow we have will also keep us cold longer. Celestially, February 2nd is an important day. According to the solar calendar, it should mark the end of winter and the beginning of spring. Forty-two days ago was the winter solstice, the day of the year when we have the least sunlight. From that day on, the amount of daylight increases until the day when there are equal amounts of night and day. We call this day the equinox and it falls around March 21st. February 2nd falls half way between the solstice and the equinox so in theory it should mark the end of winter and the beginning of spring. Has anyone seen any crocus flowers blooming? Obviously the winter solstice is not really mid-winter. Why do we call the solstice mid-winter if it is really more like the day winter begins? This has long been a puzzle and even caused a few arguments between astronomers and meteorologists. The answer is something we call the lag of the seasons and it affects Groundhog’s day as well. Yes, it is true that Groundhog’s day technically marks the beginning of spring from a celestial point of view but our experience tells us otherwise. Our seasons lag behind what the sun tells us in the sky. Saying spring starts on Groundhog’s day is a little like saying a frozen dinner is ready to eat as soon as it is pulled out of the freezer. The northern hemisphere has been cooling down for months by the time the solstice arrives. Forty-two days with just less than a minute more sunlight each day is not enough to thaw out the frozen landscape into a lush vernal garden. The established pattern of cold weather continues for many weeks after the beginning of the increase in daylight. This lag makes it seem like mid-winter actually falls on Groundhog’s day rather than the solstice. Rest assured though that on Groundhog’s day, even if it feels like the middle of winter, we are getting an hour and seven minutes more daylight today than we did just forty-two days earlier. Groundhog’s Day may marks the beginning of spring according to the sun but it will be about forty-two more days until we feel the change enough to call it spring. It may seem like winter has a grip on the land but the sun has been working hard to reverse the trend for over a month and we’ll soon start to see those effects. Incidentally, the legend tells us that if the groundhog sees its shadow it will be scared back into the den and we’ll have six more weeks of winter. Why six weeks? How many days are there in six weeks? Forty-two. Six weeks takes us exactly to the spring equinox.